Carol Leish and her board game, "Call Me Capable"
This is a newspaper column which focuses on issues related to diabilities and abilities of people with handicaps. 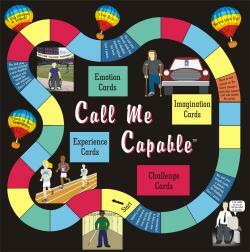 Disability Sensitivity Training Promoted By National Release of New Instructional "Game"
"Call Me Capable", a new board game designed to increase acceptance and sensitivity toward physically, mentally, and learning challenged youngsters and adults, will be distributed nationally to schools and retail outlets starting this week. Carol Leish, a disability consultant and lecturer who has successfully coped with disabilities incurred in a childhood auto accident, created the new tool. Carol says, "The purpose of the Call Me Capable game is to help people without disabilities become more aware of the many capabilities and strengths of people with disabilities." Ms. Leish, who graduated with an M.A. from California State University, and Franklin Rubenstein, Ph.D., of Franklin Learning Systems, adapted the game for national distribution.